Our week in Coeur d’Alene has come to an end. This is a real nice park, although a little expensive. Here is the Cameo from the front. The Cameo from the back showing the satellite dish. Most sites in the park have a good line of sight since there are very few trees. We are at the end of a row so the view is to the right. 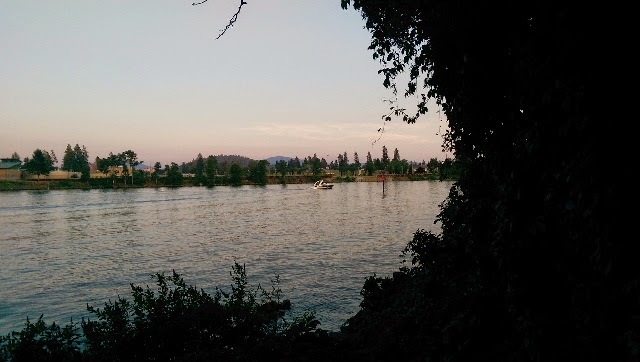 The park is right along the Spokane River which is the outlet of Lake Coeur d’Alene. The beach area in the park. We are heading to Kalispell MT today, Lord willing and the slideout comes in.